Thrilling experiences in Soča valley in combination with nice barbecue nights and great hostel vibe. Slide the RAFT… …try ZIPLINING… …make a barbecue. 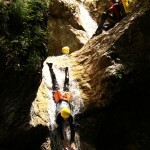 ZIPLINE to fly high… …CANYONING to slide down… …HOSTEL to meet new friends. Even two days are enough to fill you up with positive energy in Hostel Soča Rocks.